After making his name and fortune in steel production, Carnegie acted upon his belief that his wealth should be used to improve the world around him. His legacy as a philanthropist includes funding the creation of libraries, schools, and various organizations. However, Carnegie’s beginnings were humble, and years of hard work and dedication reserved him a place on the top. Andrew Carnegie was born on November 25th, 1835 in Dunfermline, Scotland. His father William was a weaver, and his mother Margaret worked various jobs to help support the family during hard times. In 1848, the family borrowed money from Carnegie’s uncle, George Lauder, Sr. to immigrate to the United States in search for a better life. Carnegie’s Uncle George was a political leader who had a huge influence on his life; his son would later become Andrew’s business partner. The family settled in Allegheny, Pennsylvania, which was known at the time for trading cloth. At the age of 13, Carnegie began working in Pittsburgh as a bobbin boy responsible for changing out spools of thread at the mill. The $1.20 he earned per week helped keep his family afloat. 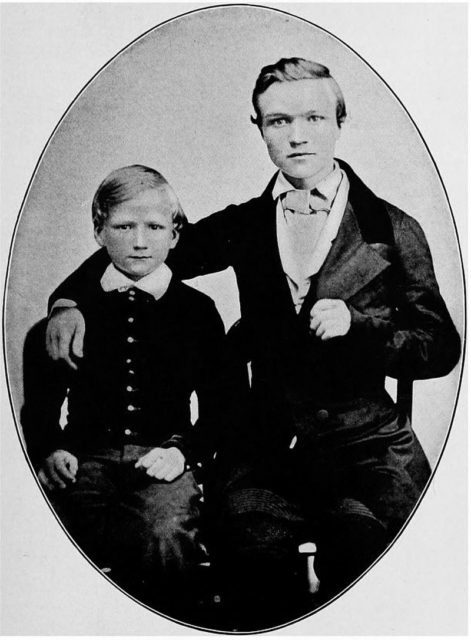 When he was 15, Carnegie worked as a telegraph messenger for the Pittsburgh Office of the Ohio Telegraph Company. Through perseverance, he was promoted to a telegraph operator. Carnegie loved reading, and he and other boys working at the telegraph company borrowed books from Colonel James Anderson. When Carnegie was transferred to the Pennsylvania Railroad Company in 1853, he quickly rose through the ranks and became a superintendent at age 18. He adroitly realized how important railroads were to the American economy. The man who hired him, Thomas A. Scott, greatly influenced Carnegie and taught him about budgeting, management, and investing in businesses. Carnegie’s mother would lend him money to invest when opportunities arose. Over the years, he was able to build capital and contacts that would become important when he made his first venture into the business world. 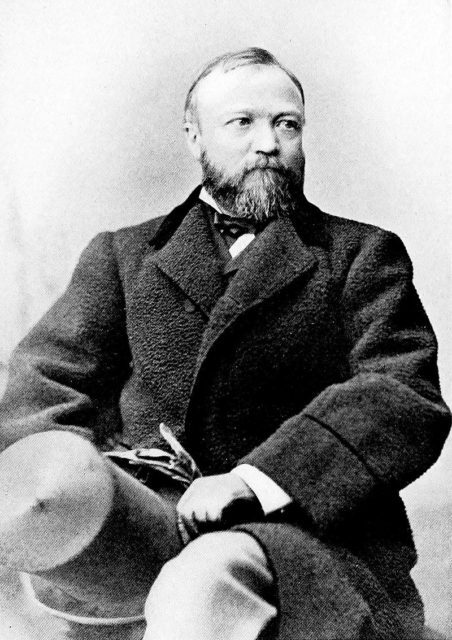 During the American Civil War, Carnegie held the position of Superintendent of the Military Railways and controlled the government’s telegraph lines. He ensured that rails were opened to Washington, D.C. and that defeated troops from the Battle of Bull Run were removed safely. Carnegie’s work was crucial to the Union war effort, and he made influential contacts in Washington as a result. He also gained contacts among investors and industrialists. 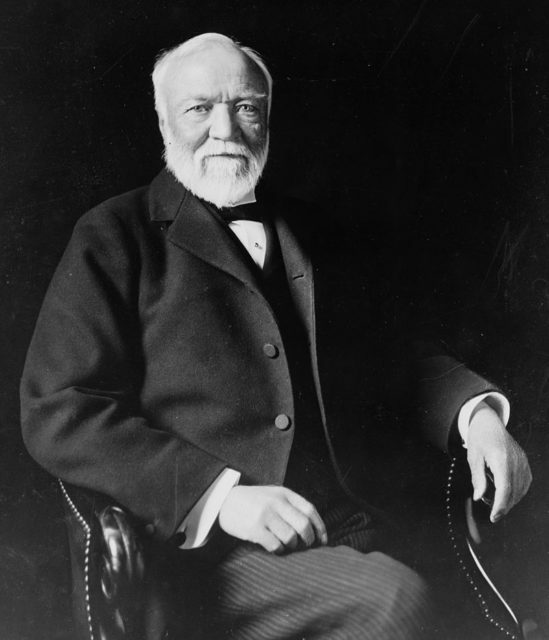 Carnegie profited during the war when Pittsburgh became a major production location for war munitions and iron, and he aided in the growth of steel production. After the war, Carnegie left the railroads and ventured into iron production, founding Keystone Bridge Works and Union Ironworks. He kept his railroad connections and used them to get business for his new companies. He married Louise Whitfield in 1886, and the couple had a daughter named Margaret in 1897. Carnegie made another business move from manufacturing to steel. 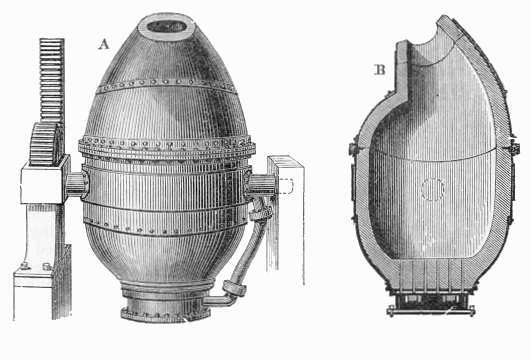 He greatly profited by using the Bessemer process to produce steel quickly and inexpensively. Intending to own all of the raw materials used to create steel, he bought out his competitor Homestead Steel Works in 1883. The purchase included coal and iron fields, a railway, and steamships. Carnegie merged all of his assets to form the Carnegie Steel Company in 1892. The end of Carnegie’s time as a steel magnate came in 1901. An American banker named John Pierpont Morgan wanted to create a broader steel industry and eliminate the excess of multiple companies which were doing the same work. To do this, he would have to purchase Carnegie Steel and all of the other major steel companies and then merge them into a single company. Carnegie took Morgan up on his offer, selling Carnegie Steel for what would amount to $13.5 billion dollars in today’s money. He was paid in gold bonds that would accrue at 5% interest over 50 years, and he retired at the age of 66. Morgan’s buyout of Carnegie Steel and other steel companies eventually became the United States Steel Corporation or U.S. Steel. Now a man of vast wealth, Carnegie focused all of his time on philanthropy. In 1889, he published an article titled “The Gospel of Wealth” that outlined his views on how industrialists should use their wealth to create and support good causes. Carnegie’s own efforts throughout his business and retirement years focused on educational and social improvements, especially the creation of public libraries. Carnegie’s goal was to create as many libraries as he could, and he eventually donated funds to open 3,000 libraries worldwide. He began achieving his goal in his hometown of Dunfermline, Scotland, by opening a library in 1883. He also provided funding for libraries in Allegheny, Pittsburgh, and Edinburgh. His directions were always focused on building the library and purchasing books to fill it, but the city was obliged to give the land and fund the library’s operation. When it came to helping educational causes, Carnegie was just as dedicated as he was to starting libraries. He donated $2 million dollars in 1901 to start the Carnegie Institute of Technology in Pittsburgh, which would morph into the now-prestigious Carnegie Mellon University. 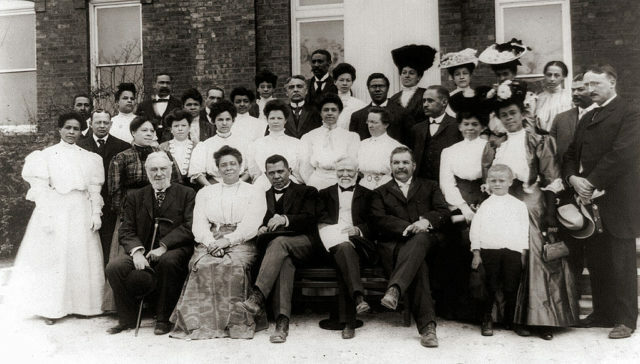 Along with Booker T. Washington, Carnegie was a major benefactor in the development of the Tuskegee Institute. He also started the Carnegie Institution for Science in Washington, D.C. 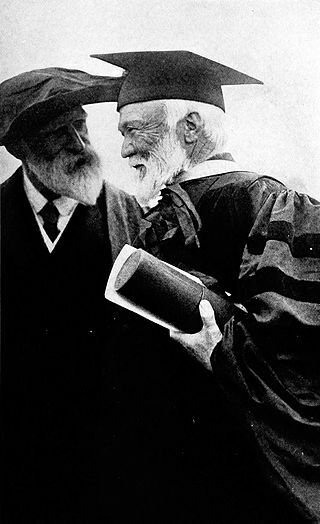 However, Carnegie did not limit his support of higher education only to the United States. 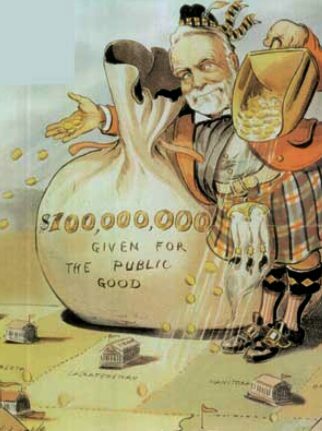 $10 million dollars was given for the creation of the Carnegie Trust for the Universities of Scotland– the money went to furthering scientific research and helping students to attend universities in his native country.When he died in 1919 of pneumonia, Carnegie left $30,000,000 to numerous foundations and charities, About Education reported. Andrew Carnegie had a double-sided nature – ruthless steel magnate-entrepreneur and a caring benefactor. His generosity continues to help people around the world and provides a model for modern billionaires who often follow Carnegie’s example in using their fortunes to further educational and social progress.